Give the gift of a Music Hall visit! Place the order here and we will mail the card to you via Certified Mail, or choose "Will Call" and pick the card up at the theater box office. 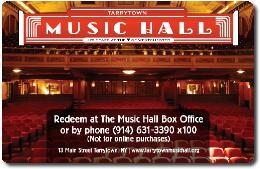 If you need a different amount loaded onto the gift card, email us at tickets@tarrytownmusichall.org or call the Music Hall Box Office: (914) 631-3390 ext. 100. Box Office is open Wed-Sat 12pm-5pm and 3 hours prior to shows. Please Note: Disregard the date displayed when purchasing, it has no meaning for Gift Card purchases. Cards do not expire or carry maintenance fees. Cards may be redeemed in person, over the phone or online.